How much does an orangery add to the value of a house? An orangery can add the 'wow' factor to any home. Interested to know more? Our handy guide will give you the low-down. An orangery now features high on many buyers' and homeowners’ wish lists. But what exactly is an orangery, and what benefits does it bring? We take a closer look. An orangery is a halfway house between a conservatory and a bricks and mortar extension. It is a warm and light-filled room that feels as though it is part of the garden. The orangery is thought to have originated in Italy. British aristocrats introduced it to the UK in the 17th century to grow orange and lemon trees during the winter. With its principles of symmetry and scale, it became a status symbol for richer families – and became very popular in the 18th century. Due to its history, the orangery continues to emanate a sense of grandeur. The focus, today, is on giving it an authentic look. An orangery is usually constructed from bricks and mortar, and features full height brick pillars, floor-to-ceiling windows and a glazed lantern roof light. It also tends to have more substantial foundations and larger proportions than a conservatory. It is seen more as a continuation of the architecture of the original house. Unlike a conservatory, you can maintain the temperature in an orangery – underfloor heating is common – meaning you can use it all-year round, as it won’t get too cold in the winter, and won’t over-heat in the summer. Orangeries are often found in Georgian properties, as well as those where balance, symmetry and scale are in evidence. It contrast, a conservatory is made almost entirely of glass. Generally speaking, it is seen as more of a garden room, and is often separated from the rest of the house. An orangery can add the 'wow' factor to any home. It is also an affordable way to add living space, functioning as a living room or dining room – or even a home office – with fantastic views across the garden. 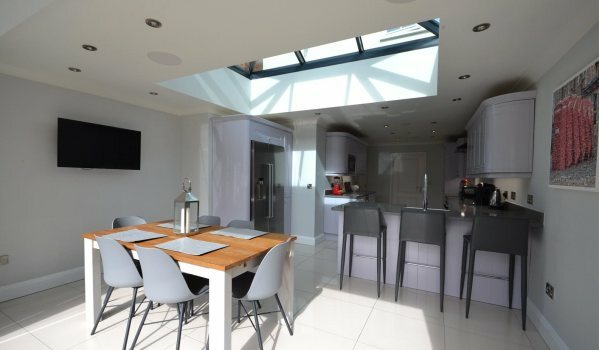 Equally, if you knock down your connecting wall, you can use an orangery to bring open-plan living into your home. 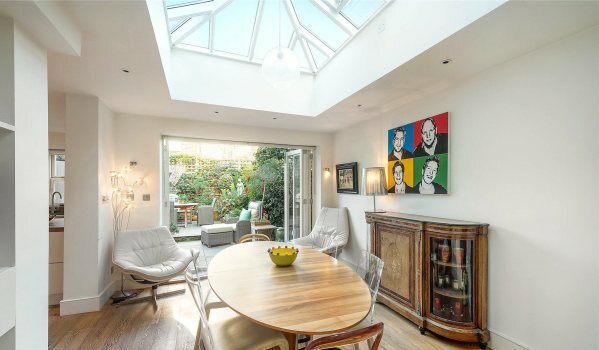 Does a conservatory add value to a property? A conservatory will add value to your home – as long as it is made with quality materials. It also has to provide a lot of light in order for the value to be significant. How much value does a conservatory add to your property? If things are done well, a conservatory costing between £4,000 and £10,000 could increase the value of your home by between 5% and 10%. An orangery can increase the value of your property by almost as much as adding a traditional extension. But it must be a big space in order to capture the essence of the Georgian heritage. Generally speaking, an orangery will be more expensive than a conservatory because it has brick walls built on proper foundations with a flat roof and roof lantern – more akin to a ‘solid’ home extension. It will require more substantial construction work, and a similar amount of labour to that required of a single storey extension. On average, an orangery will cost upwards of £20,000, but it can be cheaper, depending on the style, size, features, and materials you choose. For a well-built structure constructed from quality materials, expect to pay £2,000 per square metre. That said, for a particularly large orangery, something high-spec – or an orangery with a kitchen or bathroom – you could pay upwards of £70,000. You need to be careful about encroaching too much into outdoor space, as you don’t want to knock value off a property by making the garden too small. You want an orangery to act as a ‘segue’ between indoors and outdoors. It’s also important to give the design of an orangery thought, and to ensure it blends into your existing home. You need to ensure the construction has rhythm and scale, and that everything is in proportion. The doors should be wide enough to allow flow from the house to the garden. In addition, think carefully about the materials. Steer clear of uPVC, and consider something like Accoya, a modified timber, instead. While planning permission is not usually required for an orangery, you need to check this. If you find permission is needed, be sure to factor this into your budgeting. And, even if it’s not required, it may still be useful to apply for a lawful development certificate from the council. This piece of paperwork confirms planning was not required, and can come in useful when you come to sell. 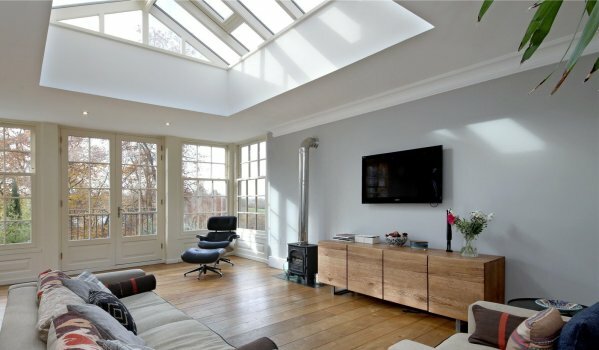 This elegant property has a well-lit orangery with bi-fold doors that lead on to a rear patio garden. It is located in a popular enclave of tree-lined streets known as 'The Sisters'. This family home arranged over three floors has a bespoke kitchen / orangery extension as well as a master suite with dressing and shower room, carport, garage and landscaped gardens. This Georgian-style property has nearly 8,000 sq ft of high-spec living space. The orangery features a gas log burning stove, full length sash windows and French doors looking out on to a Juliet balcony and gardens. Here are more properties for sale with orangeries.